Money sure is a pain in the a##. Whether you don’t have enough, or perhaps too much, the impact money has upon our lives is profound, and it tends to spur our emotions. The list of emotions we have about money is practically endless. 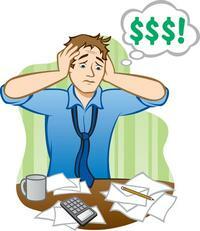 Money can cause us to worry, feel angry, frustrated, and depressed. Money can also make us feel euphoric. Remember that big commission check, or the inheritance you received out of nowhere? The matter of money from one end of the spectrum to the other makes us emotional beings. In today’s world, money runs our lives, and if one becomes too emotional about money it can ruin our lives, and our quality of life. How can we separate the two, money and quality of life? Wouldn’t it be nice if we could live a life that isn’t so preoccupied with how much money we have? Sounds like utopia, but it really isn’t. First, we all have a conscious thought that we give to money. We can either pay attention to it, or disregard it. It’s a choice. If you are worrying about money it’s because you chose to do so. Whatever your situation, getting all worked up over money is not going to help you. The more emotional you are, the more ‘crazy’ you become. And when you are blinded by emotion it impairs your judgement, and you’re more likely to make decisions that will make your financial situation even worse. Take a deep breath – Don’t panic. Yes, money is an important aspect of our lives, but there are other more important things. Are your parents alive? Are your kids doing well in school? Do you have your health? If you have two arms, two legs, and the ability to do something about your financial situation, then you’re in better shape than you think. Most of the world’s population goes to bed hungry, and don’t have enough clean water to drink. Focus on what you have, not what you don’t have. Relax, be patient, and keep at it. Do yourself a favor and don’t get emotional about money! You can’t succeed in business without a clear thinking mindset. On this date, June 13th, 1968, the Supreme Court ruled in Miranda vs. Arizona that criminal suspects had to be informed of their right to remain silent, and their right to legal counsel when questioned by the police. We’ve all seen Miranda rights play out on the TV cop shows to be familiar with them. Remaining silent prevents you from incriminating yourself by making statements that can easily be misconstrued as a confession of guilt. Did you know that there are Miranda rights in sales? Yes indeed! You have a right to remain silent, and anything you say, can, and will be used against you by prospects. When you talk too much, the greater the likelihood that you will say something that prospects can use against you. Remaining silent in any sales negotiation is impossible. However, you can say less, and keep to the point in order to avoid any misperception by prospects. That’s why asking open-ended questions is a great idea for salespeople. The more the prospect talks, the better it is for you. You are currently browsing the The Gold Call Blog blog archives for June, 2011.